Without the provision of accessible boats, disabled people are mostly denied experiences that able-bodied people take for granted. Wheelyboats remove the barriers to water-based activities thus enabling disabled people to participate alongside and on equal terms with their able-bodied counterparts. For their users, it is an important factor in the quality of life they are able to lead. We are a registered charity (No. 292216) dedicated to providing mobility, learning and sensory impaired people of all ages with independent access to activities such as nature watching, pleasure boating, powerboating and angling in our uniquely designed wheelchair-accessible Wheelyboats. 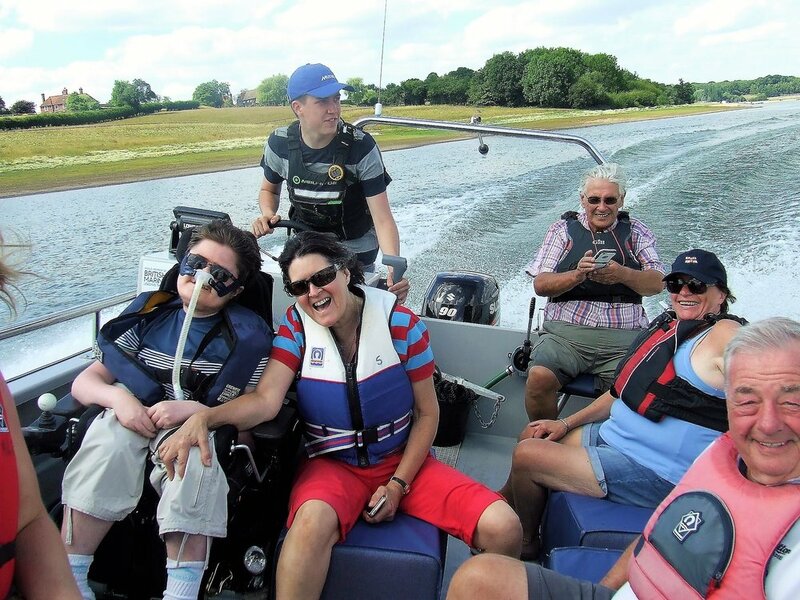 We are a small charity that achieves great things: we help venues that are open to the public acquire Wheelyboats for the benefit of their disabled visitors and we help groups and organisations acquire Wheelyboats for their own use. So far we have supplied 194 Wheelyboats to lochs, lakes, rivers, canals and reservoirs all over the UK. As far as we know there is no other charity designing, building, funding and supplying this type of craft anywhere in Europe. Find out about what we do and how we do it, the different Wheelyboat models we supply, where Wheelyboats are located and the activities they provide access to. We are very excited to announce that the Coulam Wheelyboat V20 and work of the Trust will feature in BBC1’s Countryfile on Sunday, 17 March. Filming took place at the Conway Centre on the Menai Straits, Anglesey, on 28 February where we will be launching a new V17 later in the year for North Wales Sailability. Click here to download a news release. The Wheelyboat Trust and Angling Trust have joined-forces to part-fund and supply seven new Coulam 16 Wheelyboats that will enable clubs and fisheries across the UK to provide disabled anglers, and wheelchair users in particular, with access to their waters and the fishing. The project will be divided into two parts with the first round in Spring 2019 providing four Wheelyboats and the final round in Autumn 2019 the other three Wheelyboats. Clubs and fisheries are now being invited to apply for the four Wheelyboats in the Spring round. The closing date for applications is 30 April. For more information click here. Spring 2019 issue of our annual newsletter, Waterwheels, is now available for download. Brand new Wheelyboat model in development – the Coulam Wheelyboat V17 – a multi-purpose craft designed for a wide range of activities from pleasure boating on canals to powerboating on inshore waters. Launching Spring 2019. If you can help with a donation, please click here. Watch this space for news! We enjoyed a successful Southampton Boat Show with a number of promising enquiries to follow up. Many thanks to Suzuki GB who sponsored our berth in the marina. As we were leaving the show on the Sunday, cruise liner Celebrity Silhouette was also heading out. At 1,050ft long, she dwarfs our Coulam Wheelyboat V20 and the Coulam V29.